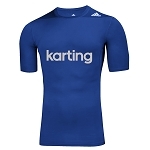 adidas new and innovative range of underwear incorporates proven technologies to afford greater performance, stamina, comfort and protection for the driver. Developed in conjunction with a leading research facility, the ClimaCool® fabric actively conducts heat and sweat away from the body through a combination of heat and moisture-dissipating materials, ventilation channels and three-dimensional fabrics that allow air to circulate close to the skin. By mapping the body’s critical heat and sweat zones designers have been able to place these technologies exactly where they are needed to optimize the athlete’s body temperature. ForMotion sculpted garments use a combination of: compression fit in key locations to control & enhance muscle activity and sculpted, 3-D engineering to boost athletic freedom of movement. • 180gr/sqm 100% Nomex® fabric. • ClimaCool technology allows breathability and moisture wicking. • Formotion sculpting for light compression and optimum fit. • Double-layer front for increased protection. • Flat seam construction for added comfort.